Revolver Espresso is one of the coolest coffee joints in Seminyak, Bali. 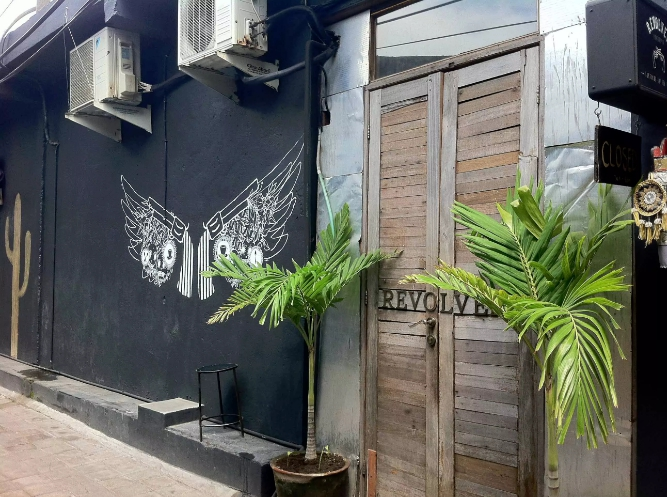 If you love coffee, and enjoy cafe-hopping, you have to drop by Revolver for a cuppa when you are exploring Jalan Laksmana. You will be hard-pressed to find Revolver Espresso unless you stumble on it entirely by accident, as they are tucked in a lane opposite the Bali Clinic and Zappa's. Alternatively, you can enter from the back of Home Store or This is a Love Song store. They have by far the best coffee on the island and some amazing breakfasts like avocado on toast with a poached egg and a lovely cappuccino to start the day off well, and lunches too. The banana and peanut butter smoothie is brilliant. The decor is very quirky, cool and fun with some mellow funky tunes playing . Like somebody commented: The coffee here is fab. Don't bother polluting your body with coffee from elsewhere. Cuisine: Café, Australian. Food options: Breakfast/Brunch. Price range: Rp. 35,000 - Rp. 58,000.